Drawing Sectors / Conic Sections in OpenLayers? 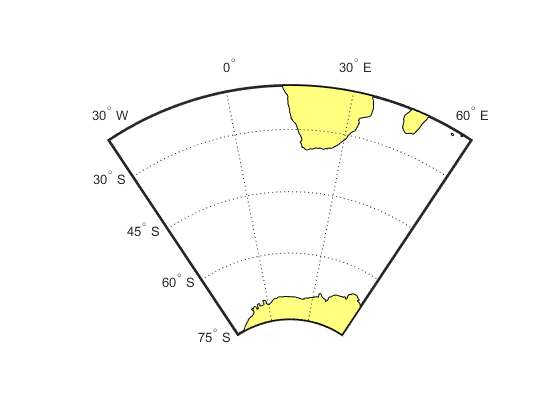 I am having trouble finding working examples in OpenLayers 5.3 where conic sections and/or sectors can be drawn. Does anyone have any working code or can point to the correct classes to use? This the the code to produce a conic section (45 west to 45 east, 30 north to 75 north) polygon on a conic projection (EPSG:2154 in this case). The meridians are straight so it is only necessary to set coordinates at regularly intervals on the curved parallels to get a smooth curve effect. Drawing pie charts with vectors with OpenLayers? Undoing last point when drawing linestring in OpenLayers 3? How to remove last drawing feature in OpenLayers 3?